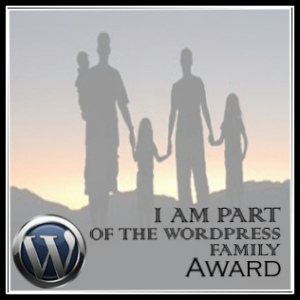 Taylor Eaton of Little Write Lies has just nominated me for the WordPress Family Award, which is given to those who make other WordPress bloggers feel like part of the family. What a lovely way to start the new year! For those of you who haven’t checked out Taylor’s blog yet, please do. I’m in complete awe of Taylor’s energy, passion and her prose. Taylor is also co-founder of The Sprint Shack, a home for word sprint lovers and writing advice. Rachael Spellman – CelenaGaia – Rach was the first blogger, who caught my eye when I joined WordPress. She blogs both articles and fiction, and has the courage to be personal in her writing. Her short story Terminal is a gem. Her writing wisdom is second to none and is full of useful examples. Jessica P. West – Jessica blogs fiction and writing advice. She got me hooked on flash fiction. Her stories can be under 200 words and she can still move me to tears. Always supportive, always fun. I wish I had more of her drive. Graham Milne – Graham’s Crackers – Graham blogs about a range of topics including writing and movies. He has a keen eye and a beautiful turn of phrase, and even better, writes perceptively about the the portrayal of women onscreen. I cannot wait to read his novel, a fantasy written in the first person about a woman with magic. Amira Makansi – The Z-Axis – Co-author of The Sowing (which has a knock-out opening scene and a great cast of characters – seriously, go buy it) who blogs articles, writer interviews and book reviews. Roger – An Ark Hive – Horror isn’t usually my thing, but Roger’s writing has changed my mind. He blogs short stories and micro-fiction. Drew Chial – Drew blogs poetry, lyrics, stories, audio-shorts and articles. There’s been times when I’ve read his blog and his words have crystallised what I had started to think but not arrived at yet. Thank you, Nillu, for your sincere kindness and generosity. Best wishes in the year to come, and all that follow. Thank you Nillu – what an unexpected surprise! Absolutely deserved on your end of course, it’s been a joy discovering your work this past year. Looking forward to the day when we can all meet up at some fancy black-tie gig and drink a toast to the times when we were laboring away in the darkness, wondering if anyone was listening. All the best for the coming year!